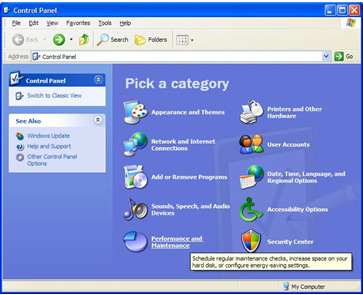 To configure Power Management on Windows XP click on Start, Run and then Control Panel. If you are in Classic View, simply double click on "Power Options". The Power Options Properties dialog box should now be displayed with the Power Schemes tab selected. Here you can set timeouts for your monitor, system standby, and hibernate. 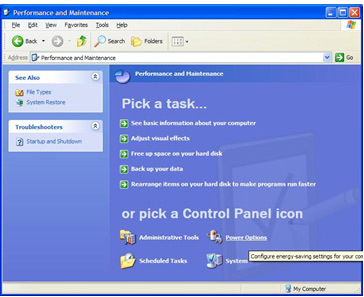 Notebook computer users can specify an alternative power scheme that will take effect when the PC is running on battery power. If you are not able to select a hibernate timeout, you may need to enable the hibernate feature. 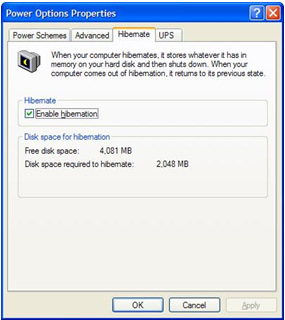 To do so select the Hibernate tab in Power Options Properties, check "Enable hibernation" and click "Apply" or "OK". You may find that your PC doesn't go to sleep after the allotted time. 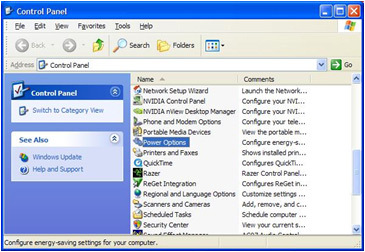 PCs may not enter sleep mode when they have a file open over the network. Additionally, certain software applications may be preventing the computer from sleeping. (Software applications can tell Windows not to enter sleep modes.) 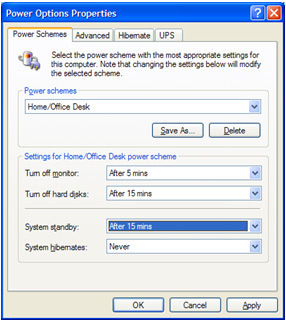 Graphics-intensive screen savers can prevent PCs from entering sleep mode as well, and should be disabled.